It’s Not an Abacus. It’s Not a Spreadsheet. It’s CPQ Pricing Methods. Describe how businesses benefit from the Salesforce CPQ pricing calculator. Describe times when the Salesforce CPQ pricing calculator is used when you quote. Describe common pricing requirements you can meet with out-of-the-box Salesforce CPQ. The business world is ever changing, and dynamic pricing in Salesforce CPQ gives you the flexibility you need to respond to that change. You and the sales reps at Infinity Solutions have to have the correct pricing at the right time to present quotes that are valid and proper. With Salesforce CPQ’s pricing calculator, you’re confident that pricing is correct at all times and that your quotes don’t include manual calculation errors. For example, Seamus from sales operations can easily make changes to Infinity Solutions’ pricing, and you and your sales team see the updated prices when you quote. When you add products to a quote, your quote automatically calculates the product prices. After that, any updates to your quote, such as changes in the quantity of the products, are reflected in the quote pricing. Subscription products and prices are automatically calculated as well, based on the subscription term you defined when you created the quote. So where do those prices come from, and how does Salesforce CPQ meet Infinity Solutions’ various pricing requirements? Out-of-the-box Salesforce functionality does some of the work, and Salesforce CPQ pricing methods and calculations do the rest. The starting point for most of your products is the standard Salesforce price book. A price book gives you a list price, or standard price, for all Infinity Solutions products. And of course, if you use multiple price books and multi-currency you can expand upon that basic starting point. And if Seamus in Sales Operations wants to define a special product price for one of your accounts, MondoCorp, he can create a Contracted Pricing just for them. 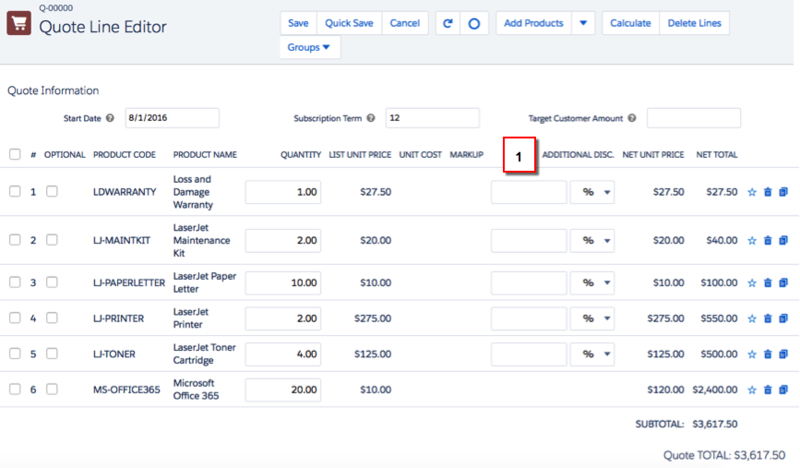 Beyond that starting point, Salesforce CPQ lets you use different pricing methods on a product-by-product basis. This means Infinity Solutions can account for the various ways you need to price your products. For example, Seamus can set a unit cost for a product, and then you and your sales team can apply a markup for a Cost Plus Markup pricing method. If Infinity Solutions has a product that should have a specific price if the quantity falls in a certain range, Seamus chooses the Block Price method. There Seamus defines the various quantity blocks and the price associated with each block. Salesforce CPQ offers more functionality beyond getting an initial product price. Seamus can apply Discount Schedules to handle tiered discounts for volume-based prices. He can also apply Discount Schedules to subscription products and automatically discount them based on the overall subscription terms you set for a quote. When you need even more flexibility, you and your sales team can manually enter discounts line by line . And Seamus can handle even more complex pricing scenarios with Salesforce CPQ, like capturing condition-based pricing and calculations with price rules. With Salesforce CPQ doing your price calculations, you and your sales team know that you’re creating technically and commercially viable quotes.